I don't like to rush to publish anything! 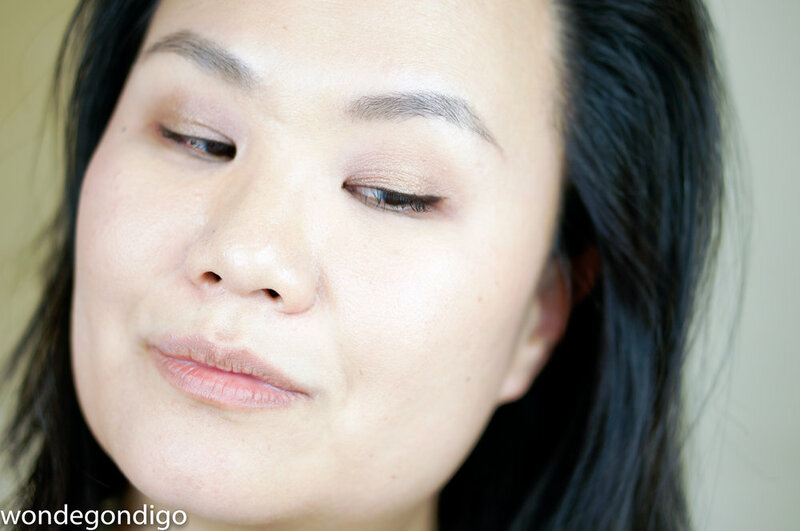 I've actually been putting my new SUQQU Lucent Powder Foundation through the paces recently (You can check out my thoughts on Instagram here & here). 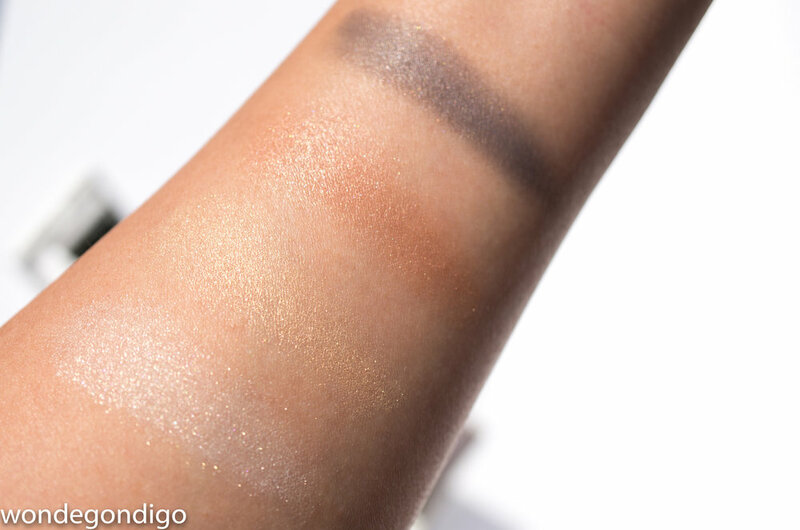 But with a release date looming (May 25th at all UK SUQQU counters) and samples freshly delivered, I wanted to get some quick thoughts and swatches published in case you wanted to take the plunge. The collection doesn't really have any artistic or particularly poetic visual inspiration from what I can tell, but it does have a very summery look on the model featuring bright blue eye shadow and pretty nail art from their revamped nail polish range. White cases. 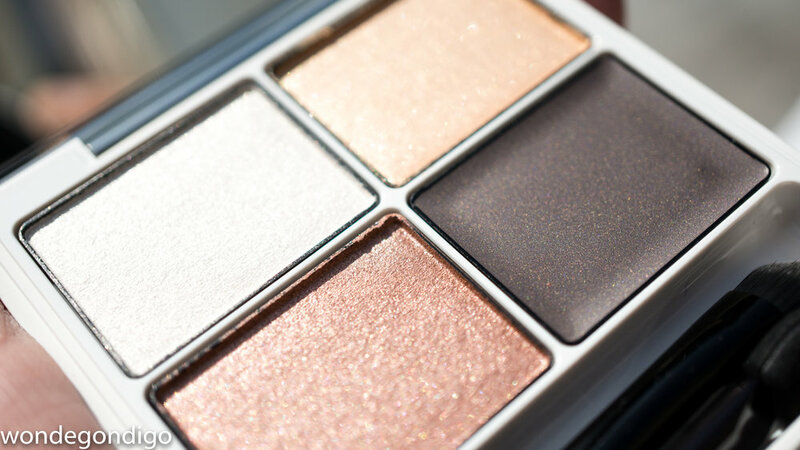 The Refining Color Eyes palettes have a gold trim. The flat enclosed brush is super functional and nice quality. 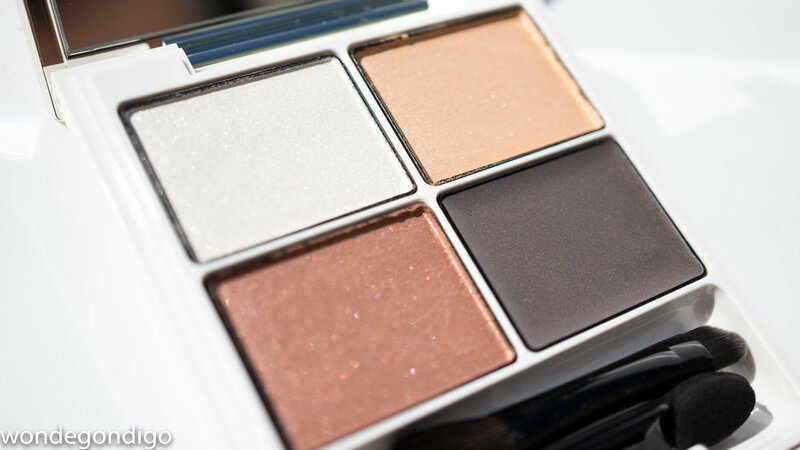 It actually does a great job, using the broad side, to apply a diffuse layer of color on the cheekbones and then using the tip to target a small area. I don't usually ooh & ahh over the enclosed applicators, but this one is particularly nice. There's some alluring fine gold shimmer in the pan (which I can't see on the face). 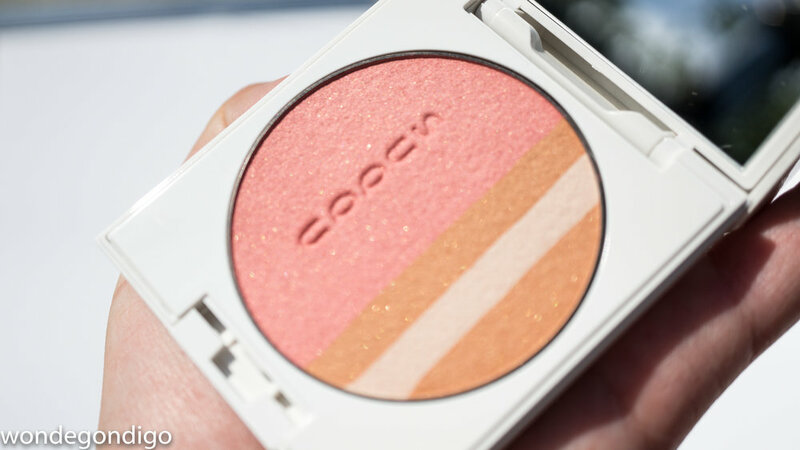 I thought that the warm peach shade can be used as a blush and the striped tan & cream part can be used as a soft bronzer. 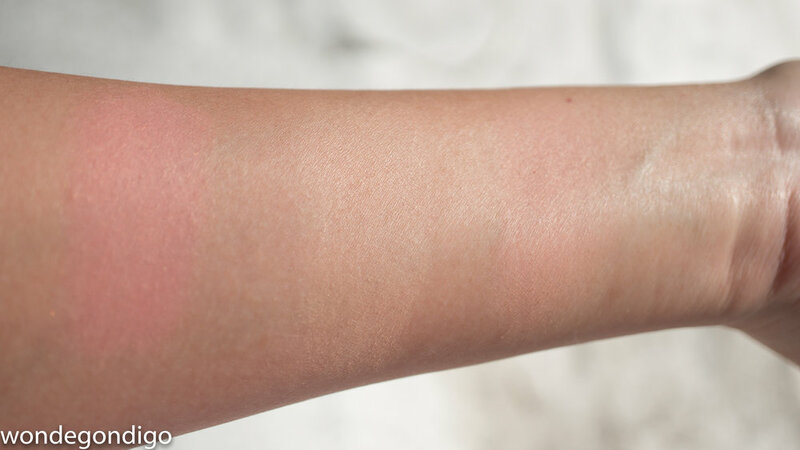 Turns out that the tan / cream side is very pale that even on my slightly tanned skin (~NC25 or so), it sort of fades into my skin. 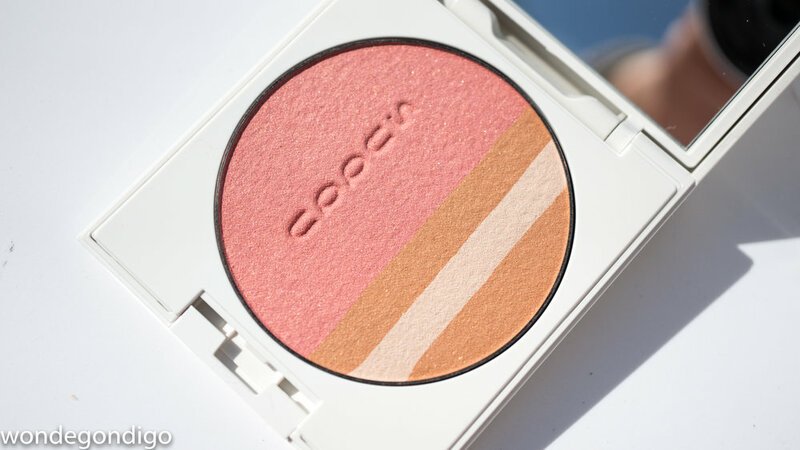 However, mixed with the peach side creates a soft peach shade. I think anyone deeper in skin tone than N*25 or so wouldn't see much color when applied. The texture is lovely. 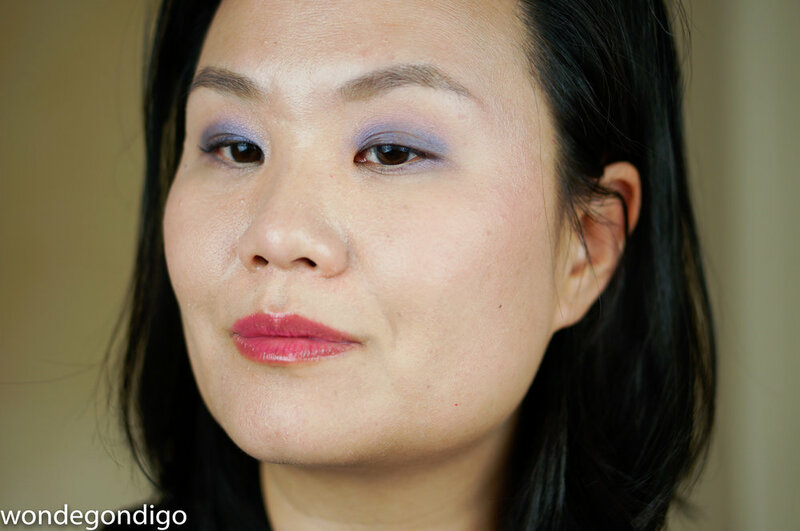 SUQQU really does make beautiful face powder products, but even with the blush side very generously applied, the effect on my cheeks is very subtle. Of course, just to mess me up a little bit, it has too much deep and warm peach tone to use as an all over color. I am totally surprised by what I liked and what I didn't like. 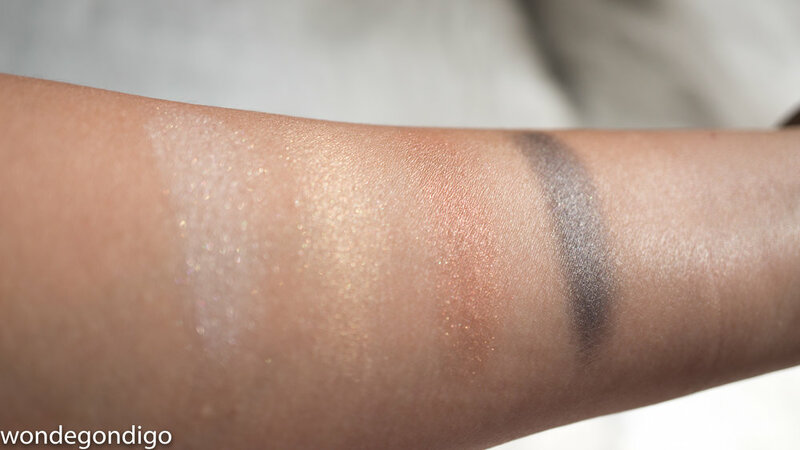 First, these quads have a cream shade (lower right pan) and then three shimmer shades. Having a cream shade isn't really my favorite; I always worry about these things drying out. 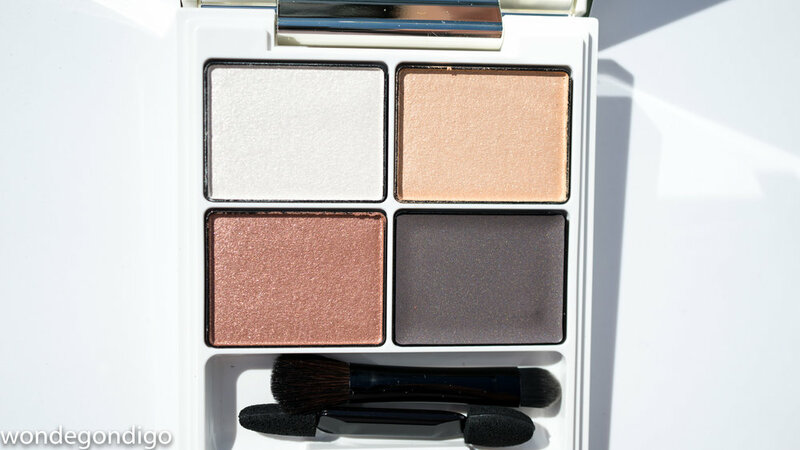 But sometimes these creams are handy for use as a nice lining shade or as a base to create intense smoky eyes. Color-wise, this one looks almost boring and very easy to pass up. I'm sure if I were at the counter I would likely be more tempted to purchase Aonagisa with its bright blue and pink tones but then be moderated by boring neutral-loving soul and buy Hikarisuna (all the while grousing over my boring tastes). 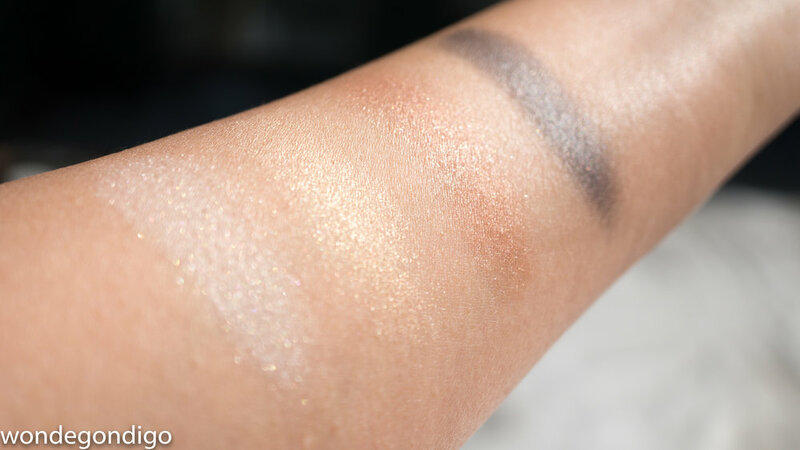 It even swatches kind of sedate, despite all the uniform shimmer in the powder pans. Hikarisuna looks awful like Mitsucha (d/c) doesn't it? I no longer own it to compare it for you, but the gold and bronze tones are very similar. But instead of a dark warm brown in Mitsucha, Hikarisuna has a cool matte brown cream shade. 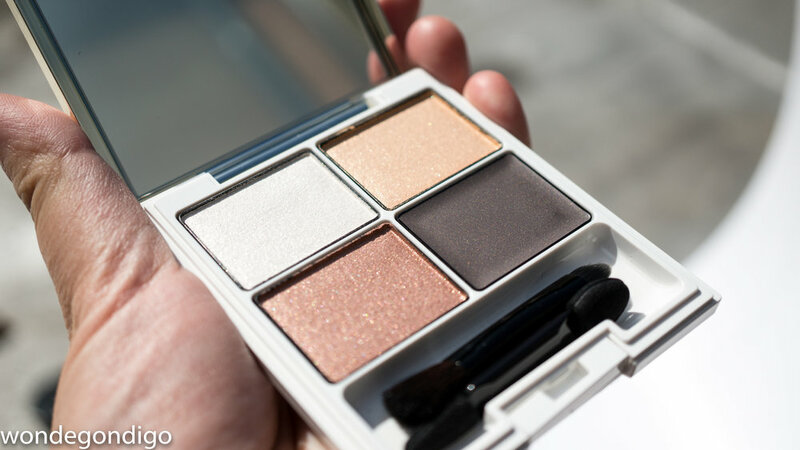 With brown winged liner, I love the play of the cool brown cream shade, the bronze that inexplicably turns taupe on skin and gold in the center of the lid. The blush barely shows at all though. I wish I had nicer things to write about this quad, because this cheerful summery color combination is very appealing. But the performance of the cream shade and then the very sheerness of the other three shades really didn't fit the bill for me. Freshly applied, it looks fine, but just a few short hours, the cream shade completely deteriorates and the sheer shimmer shades fade. 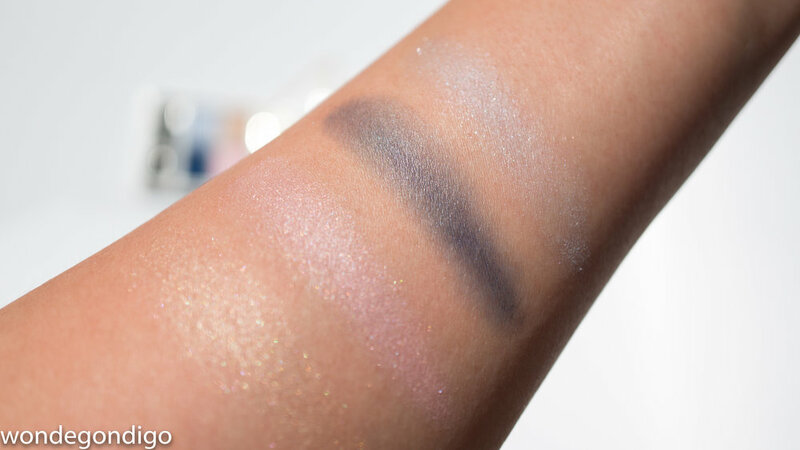 Blue cream used as a base, topped with the pale blue shadow and pink in the crease and gold above the crease and in the inner corners. Obviously I have my favorites. I'm unexpectedly delighted by 105 Hikarisuna, it suits my plain tastes and for me has some interesting warm + cool tones to keep it from going into to sleepyville. Aonagisa I'm afraid isn't go to do it for me. This collection launches in the UK on May 25th at all SUQQU Selfridges, Harrods & Fenwick counters. Ordering: Collection is available for purchase on May 25th. You can contact via email (suqqu.london@eqpuk.com) to order, or call Selfridges London at +44 (0)207 318 3956. Other option is to order on line at selfridges.com. 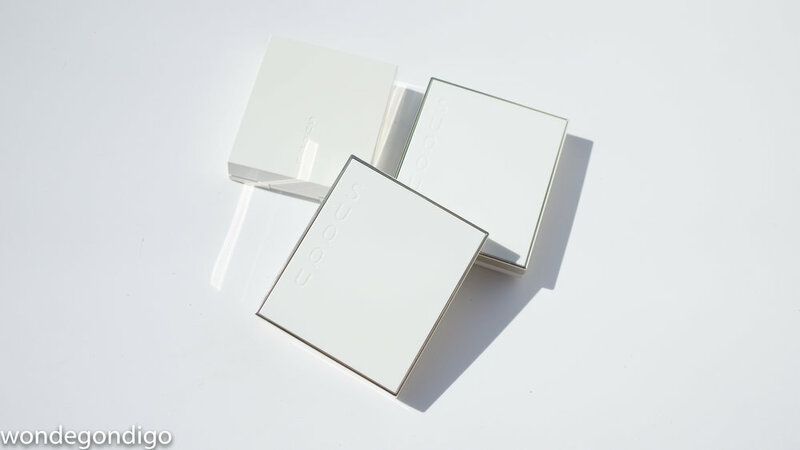 Fans of SUQQU know often that these limited edition items are difficult to get a hold of at times. Seems these days contacting the counters directly, or emailing is your best bet. You can inquire about shipping and processing fees.